In honor of their campus implementation of the Leader in Me Program, Blackland Prairie and Double File Trail elementary schools have been designated Lighthouse Schools by the Franklin Covey Institute. Blackland Prairie and Double File Trail are two of six schools in the Central Texas region to earn this distinction and join Teravista Elementary School as Round Rock ISD schools that have reached this status. The designation as a Lighthouse School indicates a campus is serving as a model for leadership development and implementation of the Leader in Me. After three years, both campuses went through a formal Lighthouse review by the Franklin Covey Institute. Since its official launch nearly a decade ago, nearly 4,000 public, private, and charter schools across 50 countries have adopted the Leader in Me process, while more than 300 schools have achieved the prestigious Lighthouse certification. It is earned by schools that demonstrate the following. 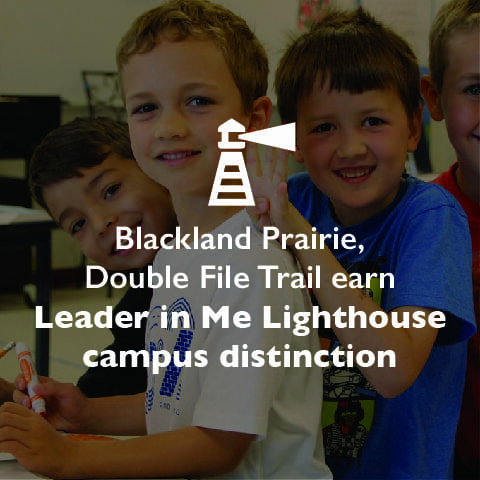 Blackland Prairie and Double File Trail will maintain their Lighthouse Certification the next two years and will continue to foster their growth and proficiency in exemplifying a leadership culture and principles. At the end of the two years they will be able to recertify its Lighthouse Certification through a virtual self-assessment, describing and celebrating their growth and accomplishments their original Lighthouse designation. Leader in Me is a whole-school transformation model and process—developed in partnership with educators—that empowers students with the leadership and life skills they need to thrive in the 21st century. Leader in Me helps students learn how to become self-reliant, take initiative, plan ahead, set and track goals, do their homework, prioritize their time, manage their emotions, be considerate of others, express their viewpoint persuasively, resolve conflicts, find creative solutions, value differences, and live a balanced life.